(L-R - ?, ?, Ryan Clement, Lawrence Dominguez, ? 1988-89 - (Mark Andrews: Lead Vocals; Ryan Clement (Former NXT): Keyboards & Vocals; Don Hill: Bass; Mike Glover (Formerly of the Philistines): Drums; Ray Valdez: Guitar & Lead Vocals). After the demise of James Blond, it was decided that The Strawberry Zots should be pursued as a full-time project. They played 60's music along with originals. 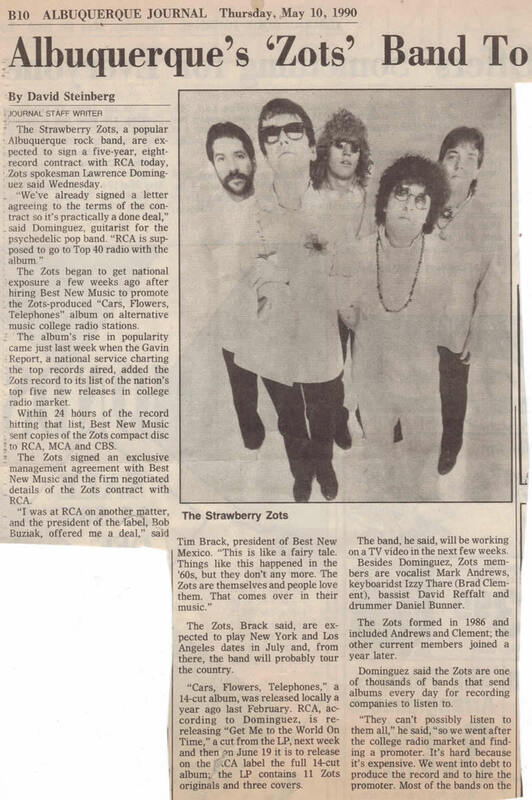 (Despite the perception that the Zots played all covers --- original material was included from the very first show. The originals were disguised and made to fit in with the covers. Further, the originals were never pointed out to the audience. The Band donned wigs and 60s paraphernalia, projected dancing oil blobs, and employed go-go dancers with bee hive hair-dos. The approach to the music was more Ramones than Monkees, more punk than classic rock. The band would play 45 minuets to an hour, sometimes non stop, performing close to 20 songs in one set. Also more punk than classic rock were the bands stage antics. Six months after the first performance the band had gained a large following and was filling clubs to capacity even on usually off nights (Sunday Thursday in Albuquerque) and generating lines at the door on weekends. After the initial 6 months original band members left one-by-one to pursue other options: Don Hill and Mike Glover moved separately to Los Angeles, Ryan Clement became manager of Grandma’s Music & Sound, and Ray Valdez took an offer with another band (for a very large increase in salary). Dave Reffalt replaced Don Hill on Bass, Mox Montoya (formerly of the Magnetix) replaced Mike Glover, Brad Clement (Izzy Thare), who had been doing the visuals, replaced his brother Ryan, and Lawrence Dominguez (Formerly of Ritual and the Dallas, TX band the Molly McGuire’s) replaced Ray Valdez. Replacing Brad on visuals was Robby Poore who added 16mm projectors, slides, and other elements to the show. Finally, after a parade of go-go dancers Jill Unze and Em Holt become the Zots’ regular dancers. It is this line up of the band that records “Cars’ Flowers, Telephones.” The album was recorded serendipitously. Andy Crevenna had just purchased a mountain of audio gear and was opening a recording studio he called “White Wolf.” Andy and Lawrence had been taking a studio engineering class and Andy asked Lawrence if the Zots would like to come in and record for a few weeks for free so he could work the bugs out of his studio. So, for what was probably a total of 7 or 8 days the band recorded and mixed their entire first album writing one quarter of the material in the studio. At first the band had no real intention of releasing anything other than a few 45 rpm records (having released a 45 earlier that year with a cover of the McCoy’s “Hang on Sloopy”as the A-side, and the original song “Working Girl” as a B-side). However, they decided to pursue releasing a CD. Having amassed some funds from gigging around Albuquerque they took the album to LA to be mastered and released it with artwork based upon doodling done by Mark in the studio. The Album sold well locally and with the help of an investor the Zots decided to hire a promotional/marketing firm to push the album to college radio. The Album was added by 60 stations in its first week of national of release generating a buzz with major labels generating several offers --- the Zots accepted the deal offered by RCA, and signed in May 1990. Prior to being signed Mox Montoya leaves the band and is replaced by Daniel Bunner (Angry Babies). What followed was months of touring beginning with several performances at the New Music Seminar 1990, in New York City. During this period the band played coast to coast with: Soul Asylum, Blues Traveler, The Soup Dragons, The Rembrandts, Joe King Carrasco, & Dread Zeppelin, and others. 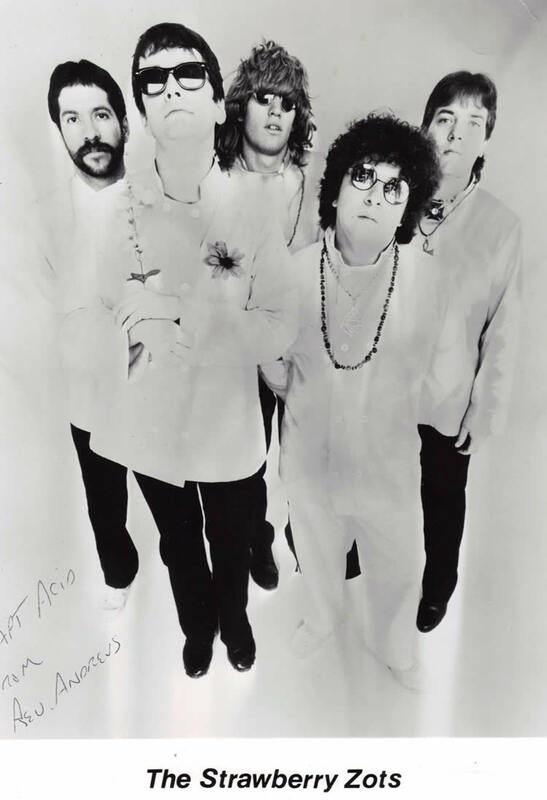 1993-1996 - Following the touring period, the band returned to Albuquerque. Daniel Bunner and Dave Reffault leave the band and work begins on Love Operation. Jay Schellen (drummer extraordinaire and old friend of both Mark and Lawrence from Ritual days) and Phil Soussan (bass player deluxe) were brought in and the what was to be the second album was recoded with Tim Stroh at Stepbridge Studios in Santa Fe. Love Operation, Friends Forever ,& Bend Me, Shape Me. It was during this time that RCA and the Zots parted company. The new president of the label came to the conclusion that there was no future in alternative rock. And the Zots, along with The Fixx, The Fuzztones, and the Hoodoo Gurus and others found themselves “separated” from RCA. The Zots went on the sign with an Indie label based in New Jersey called Continuum. Continuum released Love Operation as an EP. However; they do it with a severely altered cover. Having gone through a similar situation with RCA concerning artwork, the band had written into their contract a clause granting them total artistic control. Thus, the band had the objectionable covers recalled replacing it instead with their approved artwork. Because of this (and given the fact that the label dragged their feet replacing the covers) promotional efforts were out of sync. And, even though, the dance mix that was included on the CD did well in New York, San Francisco, New Orleans, and Chicago, and the video did well through Independent outlets in Canada and the United States, and the single “So I did” received a critics choice from Billboard and received heavy airplay in several markets, there was no product in the stores. When the record did come out no further promotional efforts were attempted by the label and sales slumped So, the label decided not to fund tour support and the full length album was never released. Enter Alan James from London. The band records some demos for “Friends Forever” at Stepbridge Studios with Tim Stroh engineering and Phil Garland producing. The band continued to play but serious burn out was setting in. Gigs became fewer and further apart and band members perused other projects. In particular Lawrence, performing under the name Lorenzo Dominguez, released two very successful and critically acclaimed albums of Nuevo Flamenco music. The Zots entered the studio one last time recoding with Stacy Parish as engineer. The product was the “Bend Me, Shape Me” EP on which the new wave and glam influences the band had been experimenting with came shining through. While material exists for a full length album the project never materialized. The Zots simply decided one day that the project was no fun anymore and made a decision to quit performing live --- though not to break up ---- leaving the door open for future performances. During this period Lawrence made the suggestion that the Zots find a new Guitar player and continue without him. For Mark, this was unacceptable. Any performances of the Zots would include Lawrence or not happen at all. The latter proved to be the case. Lawrence Dominguez committed suicide in September 2003.